Before composing something new we should understand what is already there. But we’ve already established that there is no stable, persistent “context” to begin with—that it emerges through action. So, how do we understand the current state if it won’t sit still? The key is in studying the experience from the points of view of the agents involved and how they think and behave. Those points of view provide the dynamic landscape—and the principles we derive from it—that puts everything else into perspective. These agents can be individual users, groups of them, organizations, and even digital actors. Let’s begin with how humans work—and how they understand their experience as narrative. Recall our working definition: context is an agent’s understanding of the relationships between the elements of the agent’s environment. The environment exerts more control over that understanding and action than we often realize, but that influence over the experience has its limits. Ultimately, the final interpretation and recollection of any experience is up to the individual who has it. As we learned earlier, a stone lying along a path can be clutter, a tool, or a piece of a wall—it all depends on the context the agent brings to the perception of the stone. People find meaning in the environment even when there is no semantic information there at all: clouds can look like trains and elephants; the burn marks in toast can look like a religious icon; tree branches can look like human arms. 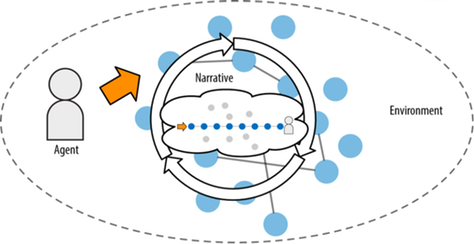 The way we perceive our environment in the moment is through information pickup, but the way we understand our experience is through narrative. Humans make sense of the world through stories. Unlike our nearest primate cousins, we have the ability to follow a substantial narrative such as in a conventional-length movie. Our brains don’t only react to each moment of action; we can also integrate complex threads of story over a significant period of time. We bring this ability to our own lives and how we find meaning in our actions and experiences. What we do in a given day might or might not have linear causality or rationale. But, we can’t help seeing a narrative (Figure 1) when looking back on those disparate events. Our personal stories are what we construct for ourselves in hindsight. Consciousness is not a single entity; it involves many processes and specialized systems across the entire organism, many of which aren’t obviously connected. Remember, we perceive-and-act by using soft assembly (Chapter 4): our bodies are full of tiny sensemaking systems and feedback loops for which there is no empirically identifiable “boss” in charge. It’s the coalescence of all those disparate systems that makes it possible for us to perceive ourselves as discrete, coherent selves with personal histories. Consciousness emerges because we have the ability to interpret our experience, reconstituting it into a narrative whole. Daydreaming is a complex family of psychological activities that take up much more of our lives than we realize, and could even be the mind’s default state. A lot of this story-weaving happens in what we colloquially call “daydreaming.” It turns out daydreaming is a complex family of psychological activities that take up much more of our lives than we realize, and could even be the mind’s default state. Stories, and their indirect lessons, have even been shown to be a superior way of teaching children new behaviors than just-the-facts instruction. Although it’s true that most of our actions in a given moment aren’t explicitly conscious, our later recall of those actions tends to be a conscious, narrative-weaving act, even if it’s a split second afterward. In fact, the effect left on us from the pain or pleasure of an experience is largely reconstructed from only parts of what we actually experienced, according to what’s been called the Peak and End Rule: “Global evaluations are predicted with high accuracy by a weighted combination of the most extreme affect recorded during the episode and the affect recorded during the terminal moments of the episode.”  For example, if asked to rate our enjoyment of a movie every few minutes as we’re watching it, the average of our ratings during the movie doesn’t necessarily correspond to how we rate the movie after it’s over. So, we might see a film that’s actually quite mediocre, but rate it highly if it has a great middle and ending. This effect can work the other way, as well—a really crummy ending can drastically harm our remembered experience of an otherwise excellent film. Other research has qualified this finding: even though the emotional effect is strong, it doesn’t mean we remember the facts of the peak and end any better than the rest of the experience—and, the memory is more affected by the end than the peak. Those strong emotional points, and strong emotion in general, can shape and distort our narratives in relation to actual facts. According to one neuroscientist, “We all have narratives…. We’re all creating stories. Our lives are stories in that sense.”  Initial, direct perception occurs outside this narrative construct, but it generates and feeds the narrative; by the time we are aware of and reflecting upon any perception, it’s part of our narrative. Context emerges out of action and sensemaking. But that doesn’t mean the environmental elements we design don’t have any structural, narrative influence. Even though we can’t literally reach into a person’s consciousness and meticulously create an experience, we can definitely shape the environment in a way that all but guarantees one sort of an experience over another. People don’t visit Disney World and mistake it for Las Vegas; and they don’t visit Amazon and mistake it for the Library of Congress. The structures of those environments, the combinations of what actions they enable, make them places that nudge people into particular sorts of experiences that meet specific needs. Still, ultimately, information architectures invite agents into a dance with the environment, in which the outcome is always unique, no matter how immersive or carefully sculpted the structures and rules we create. What we design is environmental, and the environment exerts control over what is possible to perceive and act upon. I remember going to Disney World with my parents when I was around seven years old. At the time, I was crazy for space stuff—astronauts, moon landings, everything. I’d heard of Disney World’s Space Mountain and couldn’t wait to see it in person. This was the 1970s, so there was no Web site to read about the attractions; our only knowledge was based on a few scraps gathered from pictures on TV. My parents and I assumed it was going to be like an indoor museum of space-themed exhibits. After all, what else would be in a big futuristic dome-like structure (see Figure 2) like that? My dad was the one who took me inside. After waiting in line for a while and getting strapped into a rocket-shaped rail car, imagine our surprise when we took off at high speed through a twisting, jarring, and nearly dark roller coaster—my dad gripping my waist, afraid I’d slip out into the void. It was thrilling, but not what we were expecting. When we finally disembarked, stunned and bewildered, we wondered how we hadn’t realized what we were getting ourselves into. What we design is environmental (Figure 3), and the environment exerts control over what is possible to perceive and act upon. We didn’t emerge from Space Mountain recollecting it as a water ride, or a rock concert—that would’ve been nonsense. But, we did manage to slip through an unintentional loophole, because our expectations remained unchanged until we were zooming through the dark. Figure 3—Designed environments should meet people where they are and supplement their narrative with what they take away from the experience. Context involves the stories people bring along with them. Their recollections of prior experience, combined with their “feel” for where they’re headed (whether an explicit goal or a tacitly meandering direction), are part of the context for which we design. As much as we’d like to think that we can completely control the experience and reset the users’ expectations, we can’t fully control their narrative. We can only influence it, nudge it, with environmental conditions—sometimes significantly, and sometimes only marginally, but never completely. For my dad and me, roller coasters were always outdoors, and enclosed attractions were always more subdued, based on our learned experience. Of course, I love Space Mountain and I hope Disney never retires it. It’s a thrill ride, and it did its job. However, when people need an environment to meet the expectations of invariance that it signals, only to find out it’s not what it seems, the result is real damage—to people’s trust, or worse. Organizations are made of people, so when all those different individual perspectives are added together, an aggregate narrative emerges. Users aren’t the only ones with a narrative perspective or who work their way through an environment in an embodied, tacit manner. Organizations are made of people, so when all those different individual perspectives are added together, an aggregate narrative emerges. Or, many narratives emerge from subcultures in the organization, which frequently conflict with one another. Often, you can see the narratives rubbing against one another in the structural distortions and fissures of the environments the organization creates. Even before opening each top-level mega-menu, it is clear that there are several cultures within the company that are trying to express themselves within the “top” structure of the site. Why is there Coffee but also Coffeehouse? Because Coffeehouse is actually a label for Starbucks’ foray into entertainment media, part of its attempt to make itself a lifestyle brand that goes beyond coffee and snacks. It borrows from cultural affectation more than from clearly signified indication of its contents. What is Menu? It’s about the food and drink available at the physical Starbucks shops, which some might think of as more related to the Coffeehouse menu item, but the relationship is muddled. Card is about the ways in which customers can use the object of “card” to have a “rewards” account with Starbucks, but it’s also about gift cards, which are not the same as “rewards membership” cards. This distinction is not easy to discern, even after reading the site’s content. One part of the company is pushing a rewards program; another part is pushing the ability to transact within the nested structure of a long-term “account” relationship with Starbucks, and another is managing the product/ service of gift cards. It turns out, however, that gift cards and rewards cards are not well connected in this service ecosystem. We haven’t even touched on the public-relations-driven priorities of the Responsibility area, or the confusing relationship between Shop and Menu (am I in a Starbucks store of sorts while I’m on the site?). These are elements that do not nest; they are parts that are not well composed. It’s not a “society of rooms” as much as a “jumble of objectives.” They reflect silos in which specific sets of requirements were met, but then thrust into the pile of “brand” like one might jam a juicer into an overstuffed attic. What I hope is, after the preceding chapters, this no longer seems a hopeless mish-mash, but a sort of X-ray film with which you can begin to diagnose the structural problems of labels, relationships, and rules. It’s the first step toward considering how it might be improved with a clear ontology, a well-formed taxonomy, and a resilient choreography across the service life cycle. Information architecture can address the contextual dissonance here by identifying the joints in the Starbucks semantic universe and prescribing how they should be mended and reshaped. The card, the physical store, the smartphone app, and the Web site all seem to have different perspectives on how the entire ecosystem should operate. The language facing the user is part of the problem, but the deeper problems come from how the organization uses language to define what it’s putting into the world in the first place. Layers like these are what make manifest the organizational narrative. The stories it tells itself are etched into its infrastructure, its departmental org charts, and its communication channels. Understanding the organization is an essential part of information architecture. No matter what user research discovers, it is often overshadowed by the hidden narratives and maps that such research could bring into visibility when used on the organization itself. If the organization is trying to develop its own product and service spectrum but is also acquiring products and services by purchasing third-party platforms and companies, these two narratives will clash without careful architectural attention. Or, if the organization is driven by silo-generated narratives, even its internally created structures will scrape against one another and distort coherence by the time they reach the user. If the organization is trying to develop its own product and service spectrum but is also acquiring products and services by purchasing third-party platforms and companies, these two narratives will clash without careful architectural attention. Recall the Google Groups example: acquired or newly developed layers of the Google ecosystem, all created to be some kind of “group” capability, but without really defining what “group” means in the context of all the others. Or, consider Apple’s iTunes, which has long ago lost any coherent sense of being a music application, contorting itself over the years into a surreal goulash of ingredients: a multimedia purchase channel, a media file-management platform, a software app purchase store (but only for some kinds of software), customer-account management portal, and driver of core operating system components. In all these cases, ambitious new platforms were added to existing ones, rich feature-sets were integrated into the environment, and teams shipped working software that technically delivered on each project’s requirements. And yet, it ended up rendering confusing, frustrating experiences. More often than not, if we pay adequate attention to how language is acting as infrastructure, we have more success when we make new things. The answer to the question “What are we making” should attend to more than the roster of features on a wish list, whether the list comes from an executive or voice-of-the-customer data. It is fundamentally an ontological discussion that uses language to determine what the organization is doing to the existing environment, and why, before jumping to how features will be acquired or added. Narratives and situations all contribute to the way context is composed through the ongoing engagement between agent and environment. The compositional elements aren’t limited to what happens in a project room. When devising the information architectures for these omni-channel environments, we need to consider multiple points of view, based on real-life understanding of people, systems, and organizations. A sacred tenet is that we should understand the goals of users and design for those goals. That principle sounds fine on its face, but the truth is more complicated. Organizations have a vested interest in their stories. Regardless of what challenges they face in their current dysfunctions, their aspirations tend to be toward efficiency, linearity, and planned outcomes. The received wisdom of user experience can often be just as vested in those assumptions. For example, a sacred tenet is that we should understand the goals of users and design for those goals. That principle sounds fine on its face, but the truth is more complicated. Remember: our preconscious, tacitly comprehended encounters with the environment are what drive most of our actions in a typical day. And, the way we experience something is based more on our peak-and-end heightened recollection than the actual facts of the activity. It turns out, there’s no straightforward way to always know someone’s goal. The goal is often a reification—part of a story that didn’t exist before the activity. 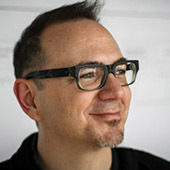 When watching how people actually think and behave outside of a usability lab—starting before they’ve engaged a product or service, and seeing how they behave all the way through—we find many of these goals emerge and take form during that engagement, rather than being fully formed plans ahead of time. And, they can be very different afterward than they were up until moments before the experience was completed. People “confabulate” their experience to the point at which, according to neuroscientist Michael Gazzaniga, “listening to people’s explanations is interesting… but often a waste of time.”  For neuroscience research, it might be a “waste,” but I still believe hearing people’s stories is important work for designers, because we’re not scientists trying to understand the brain; we’re designers interested in how people understand their experience, even if the story is distorted in retrospect. We should definitely learn how users formulate and think about their goals. We just need to get underneath those stories and figure out what’s contributing to them. In one of my projects some years ago, a financial services company wanted to provide investors or their trusted partners with the capability to change power of attorney for their assets on the Web site rather than having to use a paper form. When we talked to users about how they had done this in the past, their recollections were about “getting a form, filling it out, and mailing it in.” The main issues they remembered having were more about understanding the form, and the annoyances of printing, completing, and sending it. The environment was missing the semantic functions needed to build the contextual bridges between the organization’s systems and the real-life situations of customers. When we studied click-path logs of people who eventually found and used the proper form, we found their paths wandered—like the information-scent berry-pickers we humans are—working through what they could find about their current contextual needs. Many of these visits reached a point at which they stopped for a while, only to return and mysteriously type a specific string of characters into the search field, leading them straight to the forms they needed to choose from. When we investigated further, we discovered customers were actually trying to use the site, then calling customer service in frustration, and learning how to search for the form directly. This full-service journey had to be analyzed to understand what users were doing—it couldn’t be captured by looking at site analytics alone. The actions with the PDF form were nested within a longer arc of seeking, finding, learning, and conversing. The environment was missing the semantic functions needed to build the contextual bridges between the organization’s systems and the real-life situations of customers. The choreography had huge gaps, if it could be called choreography at all. The rules started and stopped very close to the bureaucratic process—which the technology was merely going to replicate in digital form—rather than reaching outward to provide conditional frameworks for people to discover their next steps. The site was missing environmental scaffolding that could catch users from whatever angle they entered. For example, two customers might be trying to change ownership for spouses, but one just got married, and another just got divorced. Those are vastly different situations that entail different considerations and advice, some of which should address needs beyond this specific task. Yet the site had no content or structure that addressed these life situations. Why not create these structures and explanations as a mediating layer in the environment? Then, search results could display information-scent for topics such as “divorce” or “marriage” or “death in the family.” That became the strategy: creating the contextual middle layer that connected the user’s current story with the form-based task—something that should’ve been there all along, even before converting the PDF form into a web application. This was a complex problem to solve, even though it didn’t involve advanced gadgetry or ambient digital agents. However, the principle in this project is the same for any environment: how does the environment meet people where they are? How does it couple with people’s cognitive apparatus and give the right stepping-stones for discovering their needs? How is the arrangement of parts composed so that people have the right structures for learning and understanding? 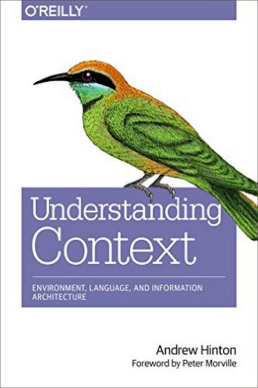 Buy Understanding Context: Environment, Language, and Information Architecture from O’Reilly, using the code BWORM, and save 40% on the print version or 50% on the ebook. Hughes, Virginia. “How Monkeys Watch Movies and People Tell Stories.” National Geographic, November 7, 2013. Retrieved February 18, 2015. Gazzaniga, Michael S. “The Storyteller in Your Head.” Discover, Spring, 2012. Retrieved February 18, 2015. Gottschall, Jonathan. The Storytelling Animal: How Stories Make Us Human. Boston: Houghton Mifflin Harcourt, 2012. Kesek, A., W.A. Cunningham, D.J. Packer, and P.D. Zelazo. “Indirect Goal Priming Is More Powerful Than Explicit Instruction in Children.” Dev Sci, September, 2011. Epub, April 28, 2011. Retrieved February 18, 2015. Kahneman, Daniel, and Amos Tversky. Choices, Values, and Frames. First edition. Cambridge, England: Cambridge University Press, 2000. Kemp, Simon, Christopher D. B. Burt, and Laura Furneaux. “A Test of the Peak-end Rule with Extended Autobiographical Events.” In Memory & Cognition, January, 2008. Hayasaki, Erika. “How Many of Your Memories Are Fake?” The Atlantic, November 18, 2013. Retrieved February 18, 2015. Hat tip to Dan Klyn for making me aware of this example. You can find a related concept involving two axes in A. Resmini and L. Rosati. Pervasive Information Architecture: Designing Cross-Channel User Experiences. There are rich resources on situation-based design, from HCI research done by people such as Lucy Suchman, Jean Lave, and Bonnie Nardi, who have adapted concepts from Situated Action Theory and Activity Theory. One place to start is Nardi’s edited volume, Context and Consciousness: Activity Theory and Human-Computer Interaction.